From the previous work, we have a WCF REST service in a console app and we have a client, but one could argue it’s not ‘real’ yet because, well, they’re both in the same console app. Much like the service console exe, we’ll want to change it from the client profile to the full framework. 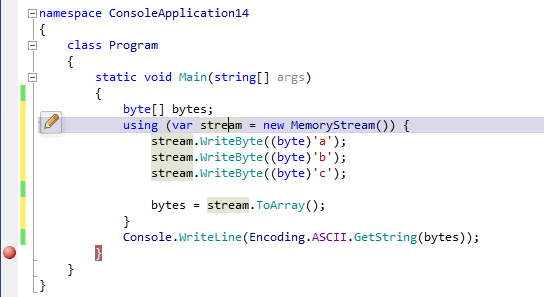 While we’re moving code around, we’ll go ahead and move the client code (the stuff inside the ‘using’ of the channel factory) to the client console exe. At this point everything should be building. There you have it – a simple, from-scratch WCF REST service, hosted in a console app. Have fun! You can choose a different name, but I stick with the default here. Notice that we’re also using the standard webHttp endpoint (the ‘kind’ attribute, just like in our service config). Now the WCF REST client calls (using ChannelFactory!) will work. So, lets extract out that service contract interface now. While we would normally move it to another assembly that would be shared between the client and server, we’ll skip creating another class library for now and just do it in the same project. 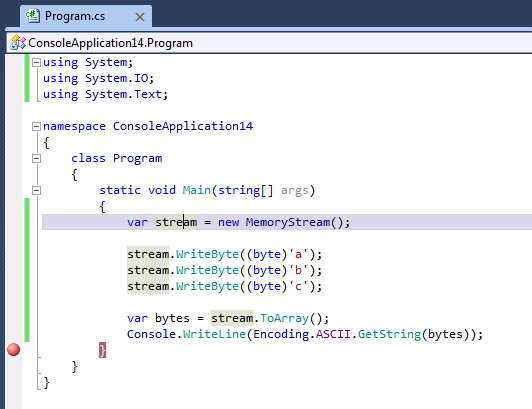 If you search the online templates in VS2010, you’ll find a WCF REST template already there. You can also see how its WCF config section (system.serviceModel) needs asp.net compat, although it’s VERY simple on the WCF config side since it just defines a simple WCF REST standard endpoint (webHttpEndpoint) and the ‘heavy lifting’ is done by the ServiceRoute and resulting WebServiceHostFactory, as per the RegisterRoutes method. It’s also a bit simplified since the template has a single service class, but no service contract involved. Using ‘Add Reference’ (the Pro Power Tools version), you can search on ServiceModel and just add the base, activation, channels, and web. While you can configure WCF programmatically (I might do a post about that), we’re going to stick with keeping our configuration in the config files so we can use the service config editor to make the changes. Now that we have a bare minimum service, let’s expose it with a service host in our Program.cs. There’s generally 2 options for creating your service hosts – create them manually (invoke the constructor) or use one of factories (ServiceHostFactory, WebServiceHostFactory). So, for now we’re stuck with making the ServiceHost instance ourselves and specifying the type. We could even pass in the address(es) for the service if we wanted (as per the baseAddresses arg above), but for now we’ll stick with doing that in the config, so our Program.cs is as above. Option 2: use the webHttpEndpoint standard endpoint which automatically includes the webHttp behavior. Since there’s not really much to gain from doing the extra work of doing the binding and behavior manually, we’ll just go with Option 2 and use the standard endpoint. It’s pretty straightforward – thanks to being able to use the standard endpoint (the ‘kind’ attribute), it’s just the address and the service type. debugging WCF? Use the SvcConfigEditor, right from VS! 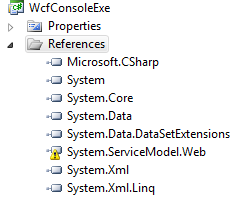 If you’re doing WCF services of any type (inside IIS or not, WS* or REST or whatever) you likely have an app.config or web.config (or both, depending on how you’re configuring your clients) that holds your system.serviceModel configuration (your WCF config). The WCF configuration is very powerful and flexible, but as such can be difficult to work with manually. That’s where SvcConfigEditor comes in, helping to at least make it a little more manageable than editing the config xml manually when trying to get your WCF server or client configured. Now, you can certainly just run the exe and point it at the config you want to edit, but VS lets you do ‘Open With’ for files, so we can add SvcConfigEditor there and then be able to do the WCF config editing right from VS.
You could click ‘Set as Default’ here, too, but I like keeping the XML editor as the default, so I don’t. This one’s related to the multi-line insert in VS2010. It seems like there’s multiple points at which R# considers the current expression ‘completed’ and does a little rewriting, but that R# rewriting doesn’t current seem to understand that the change that just happened may have happened to multiple other lines, and kills all but one of them. Whoa – what happened to the other 3 calls? I’m guessing there’s just some rewriting that R# does when things ‘complete’ (like the cast being added) and it just doesn’t take into account that it might be happening on more than 1 line at a time in 2010. Not really all that big a deal, but it hit me today, so I figured I’d do a quick little post+sshots and post the link in their forums. So, my R# settings have everything at BSD-style braces (I was a K&R guy before my time @ MSFT, but now I’m too used to BSD style to bother switching). 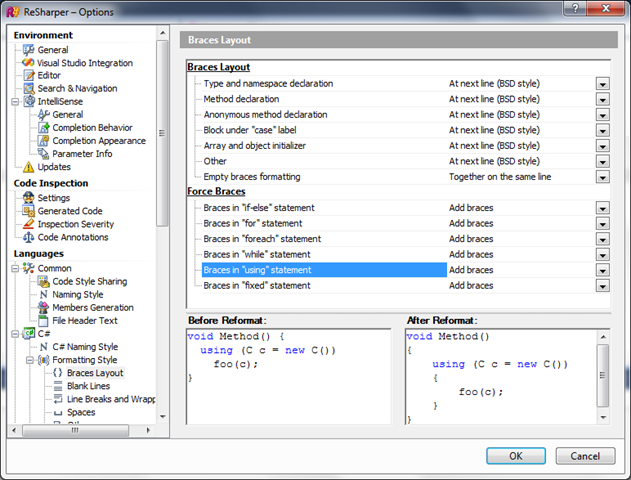 In addition, the ‘braces in using’ option specifically shows that the resulting reformat (adding braces) uses BSD style (the style used in the reformat is determined by the ‘Other’ entry in the ‘Braces Layout’ section). I love what it did, EXCEPT that it added the using with K&R style braces instead of the BSD. NOTE: I know I can (and likely will) edit the project template(s), but bear with me here. Time and again I create a new project (like a console app) and I happen to want to do what I would consider to be reasonable to expect of a client profile – like, say, be a WCF client. The client profile (obviously not new in 4, see the 3.5 entry above) just seems like a stop-gap half-fix to me. While I get that it’s easier said than done, it seems like you might as well just put the framework(s) on the web and let people choose either ‘prefetch the whole framework’ (like ‘full’ does now) or ‘fetch framework pieces as needed’ (perhaps what people paying per MB of download would choose), with a subset installed by default that includes enough to download others (obviously). Why push the pain onto the developers? I’d imagine ClickOnce (and Java Web Start before them) and Silverlight have gotten this kind of thing taken care of already. We already have loading assemblies via http paths in the framework and it already includes caching IIRC, so the lower pieces are already in place.